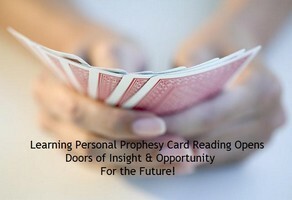 If you are fortunate enough to learn an amazingly accurate method of perceiving the future from ordinary playing cards as I was, you already know: The future opens up in ways that the average person never dreamed of. The present? At your fingertips – if you know how to use the power of perception. When I first learned how to read ordinary playing cards, I was an idiot. I had no clue how to make life better, let alone how to live it from moment to moment on my own terms…to my own benefit. Then, I suddenly found myself sitting down with a seemingly “crazy as a loon” close relative that everyone in the family thought was totally off her rocker in every sense of the word. She had very little education. She was lower middle class throughout her life. She died from lung cancer and metastasized brain cancer at age 69 after a year-long battle with both. And yet, she had this amazing ability to pick up a deck of playing cards and find nothing but dead-on insight in them for anybody who asked her for it. That was my grandmother. She was an incredibly brilliant woman. Her insights were scary…so off-the-wall when you first heard them that you thought, Get out of here, that won’t happen, you crazy old bird. But OH yeah, they did. As in, YEAH. They. Did. Just as she told you they would. For instance, she read the cards for a close female friend of mine who was 34 over the phone and told her that she would move out of town soon and marry her next door neighbor in that new location once she found out she was pregnant. She would give birth to one daughter, another would soon follow. Oh my God, this friend laughed and laughed. She laughed practically until she cried because she had been told over the years by several doctors that she was infertile and would never bear children. Before and during her previous marriage and into subsequent relationships with other men, no birth control measures were ever used. After all, she couldn’t conceive! Yeah, she agreed, this relative of mine was truly out of her mind but terribly sweet to say such nice things. Of course, she also thought, Yup, crazy off her you-know-what, that sweet old lady. Five months later, this friend moved 200 miles away. Six months later, guess what? She was overcome with joy when she called me to tell me, no kidding, she was pregnant…and the father was her next door neighbor! They were married four months before her first daughter was born. Eighteen months later, their second daughter was born. I learned this method, explained from start to finish in my book, “The Message: Your Secrets in the cards” (O Books) from that crazy-off-her-you-know-what relative of mine. I guess I’ve been just as crazy-off-my-own-you-know-what ever since. I’ve worked for AOL using the method this relative taught me and on other several big websites since 1995. It’s incredibly accurate, this method. I also teach the fundamentals of it to others here.